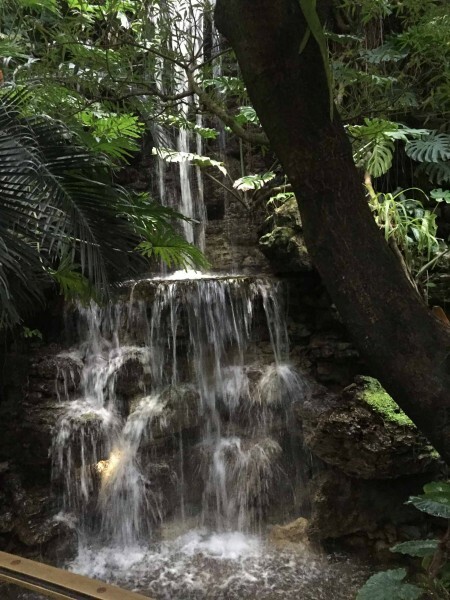 A trip to The Irwin M. Krohn Conservatory, an indoor botanical garden with 3,500 plant species from all over the world, may be second nature to some Cincinnatians, but executive director Andrea Schepmann said she is always looking for new ways of displaying seasonal exhibits and special shows. Annual attendance is approximately 200,000. 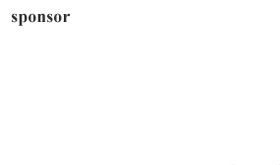 The blockbuster of the year is the butterfly show. This year, “Butterflies of the Caribbean” features butterflies indigenous to countries southeast of the Gulf of Mexico and north of South America. Schepmann has international or Floridian brokers who help her obtain butterflies. Special care is taken in the transportation and holding of the butterflies in a quarantined room. The U.S. Department of Agriculture regulates the entire process. From 80,000 to 90,000 visitors across the nation attend this exhibit, which opened in 1996. “We have a line around the building,” said Schepmann. One of her challenges is to accommodate large numbers of people and bus tours. “It is an old structure, not designed for big crowds,” said Schepmann. “We have a huge turnout of people.” The event is also the most volunteer intensive. Over 600 people donate their time to help the event run smoothly. Walking into the butterfly room brings smiles to visitors of all ages. 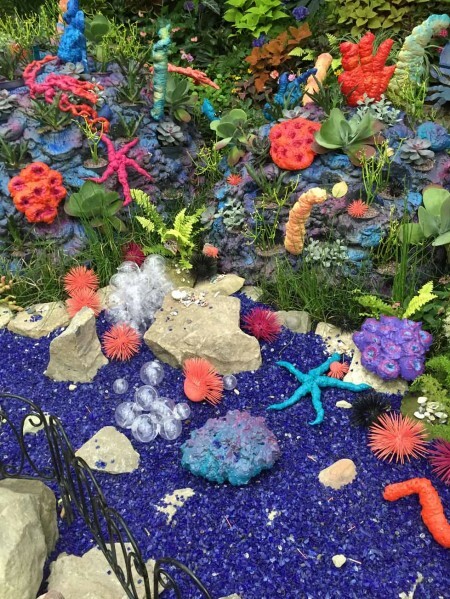 Krohn employees have carried out the Caribbean theme with bright colors, coral and sand. On an unusually cold April day, this writer found a sunny spot to remember. Available for public viewing from March 26 to June 19, the butterfly show costs $7.00 for adults and $4.00 for children. The presenting sponsor is Macy’s with additional in-kind donations. The second largest display is the holiday exhibit attended by 40,000 to 50,000 people from mid-November to early January. Applied Imagination Ltd., botanical designers, created a train display 25 years ago. Each year, Schepmann tweaks the show. Applied Imagination also made replicas of major institutions such as Procter & Gamble, Great American Insurance Co. with its tiara, Taft Museum of Art and William Howard Taft National Historic Site. Cincinnatians enjoy recognizing hometown buildings. A variety of poinsettia plants decorate the surroundings. It costs approximately $65,000 for the total holiday exhibit. A large tree, such as an 18-foot Norway spruce in 2015, filled with handmade ornaments of natural materials, decorates the lobby during the holidays. The Krohn crafters make at least 100 decorations each year to hang on the tree. Krohn has chosen Dr. Seuss’ s Whoville Holiday as next year’s theme for the show, which will run from 11/12/2016 to 1/1/2017. In addition to traditional elements, Schepmann plans to feature a whimsical design and bright colors along with amaryllis. The annual nativity scene adjacent to the conservatory is not a Cincinnati Park Board activity, but sponsored and staffed by Western & Southern Financial Group. An article on December 11, 2011, by Cliff Radel, former writer for The Cincinnati Enquirer, describes in detail the history of the exhibit. President Charles F. Williams had the original crèche built in 1939 at Lytle Park. It moved to Union Terminal during World War II for the holidays to welcome troops leaving and arriving in the train station. After the war, the exhibit returned to Lytle Park until I-71 construction began. In 1967 the company moved the display, officially known as the Crib of the Nativity, with live sheep, donkey and cow, to Eden Park. Jeff and Jody Biedenhard, grandchildren of the first builder, work behind the scenes to set up the display. Contributions from visitors benefit The Salvation Army, matched by Western & Southern Financial Fund. Other seasonal exhibits are a spring show with tulips, daffodils, magnolias and azaleas. In 2014 a Frank Lloyd Wright Fallingwater Gardens display was on view drawing inspiration from Wright’s clean architectural lines of the house by that name near Pittsburgh. The summer show often has a tropical theme. This year, the title is “Honey Bees in the Summer” from July 2 to August 21 with yellow and orange flowers. “Fall Back in Time” will run from September 3 to October 23 with a focus on a formal Victorian garden design. Additional displays include an orchid room with approximately 75 orchids blooming at any time, a palm room with a waterfall, a fern room which represents a quiet space for food plants such as chocolate, coffee, vanilla and pepper, and a desert room with cacti, succulents and desert plants. The John Carroll Bonsai Gallery is in another room. Now deceased, Carroll was the president of the Bonsai Society for two years. His legacy continues with a room dedicated in his honor in 1998 and filled with Bonsai trees tended to by members of the Society on Wednesdays when they come to the conservatory to prune or loan trees. While the displays shine on the first floor, Schepmann’s office is in the basement. She often comes up for air to enjoy the nature. 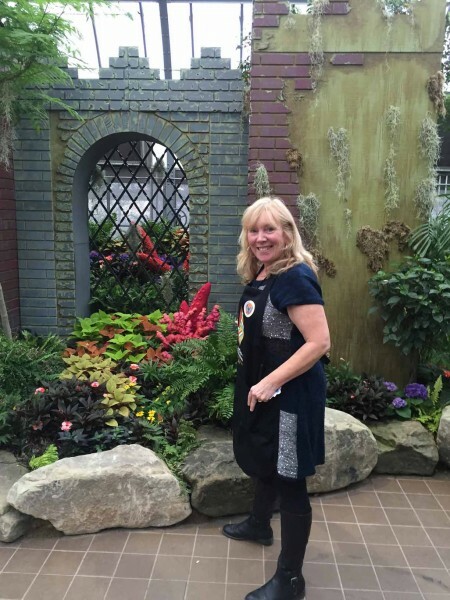 Formerly a horticultural teacher, Schepmann has spent 32 years of her life as a Krohn employee starting as a florist. She works with a modest budget and a small staff of three managers, including herself, three florists and one cleaner. She complains the gift shop is too small and humid. 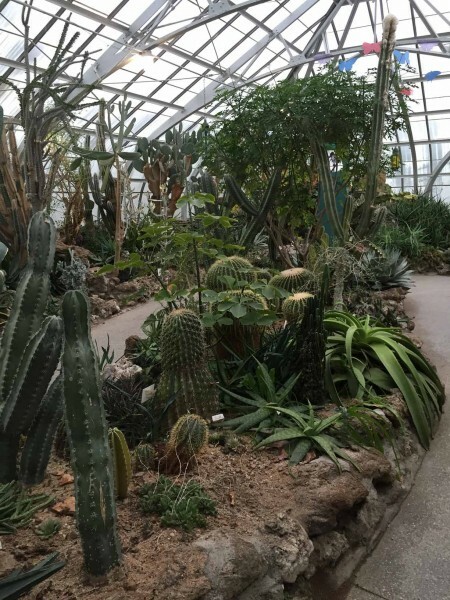 What isn’t often known is that the conservatory owns ten green houses on 20 acres in Finneytown at Warder Nursery on Warder Drive. Schepmann manages the facilities as well as two staff. The houses not only supply plants to Krohn, they also supply 30,000 annuals to 151 Cincinnati parks ranging from the large Mt. Airy forest to tiny pocket parks and greenways along the parkways. The conservatory appeals to families from the Tri-State region, but they also come from Dayton, Louisville and Lexington. Bus tours arrive from all over the country to visit. Schepmann would like to build that business, but getting tourists on and off the bus and into the conservatory for an hour can pose a challenge. Schepmann would also like to attract more young professionals. “It’s like stealth programming,” she said. This year, she tried a different Valentine program where both men and women in the 25 – 35 age range made corsages for $12.00 per person which included a drink ticket. Over 150 people attended. The concept of the park goes back to the days of Nicholas Longworth (1783 – 1863), who owned the property and called it ‘Garden of Eden.’ Production greenhouses were in existence in the 1880’s. But the public wanted to see what was growing. By 1902, there was a public display in the Eden Park greenhouses. And, in 1903, there was a chrysanthemum show. 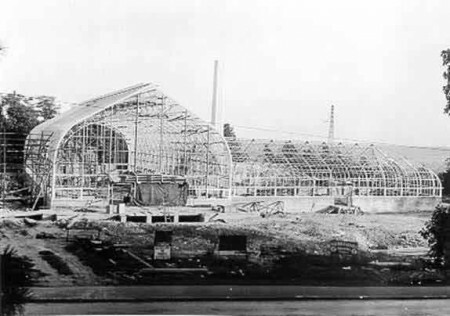 On March 26, 1933, the Eden Park Conservatory opened with a waterfall, fern house and a display wing for seasonal exhibits at a cost of $179,500. Architects Rapp & Meacham designed the conservatory in Art Deco style in the form of a Gothic arch. The first full year it was open, 1934, attendance was 305,536. In 1937, the conservatory was named in honor of Irwin M. Krohn, who spent 25 years as a commissioner on the Cincinnati Park Board. Krohn (1912 – 1948), Hyde Park resident, also served on the board of the Cincinnati Zoo and Botanical Garden, the Zoning Board of Appeals and the City Planning Commission. By 1939, a desert house was added at a cost of $24,900. A storm on July 14, 1966 damaged the building and forced it to close for the first time in history, according to an article in The Cincinnati Post on March 25, 2003. It reopened in July 26, 1966, but repairs continued through 1970. Renovations in 1976 included remodeling of the main entrance to add restrooms to the main level and a ramp to the fern room to make it handicapped accessible at a cost of $158,000, according to the Post article. A reglazing project to replace the facility’s glass began in 2001. Later additions included the creation of an orchid room and an expanded gift shop. The conservatory’s address is 1501 E. Eden Park Drive, Cincinnati, OH 45202. Phone is (513) 421-5707. It is wheelchair accessible. Originally free, the conservatory now costs $4.00 for adults and $2.00 for children, with the exception of special exhibits. Carden said, “I wish they could find a sponsor to cover entrance fees.” Families may join for $40. For more information, visit www.cincinnatiparks.com. I loved that place! Is is enchanted. When I entered the door my cares fell away and I was in a different world.